For low-grade afternoon fever, Heat in the Five Centers, flushed face, red cheeks, uneasiness, night-sweating, nocturnal emission (with dream), chronic throat pain, frequent urination, hot flashes associated with menopause. A traditional herbal supplement that enables the body to feel totally refreshed by establishing the body’s natural balance. 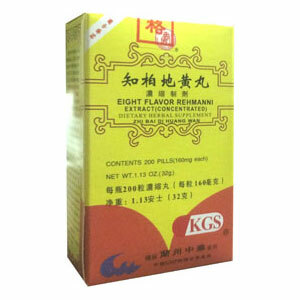 Eliminate Empty Fire, Moisten Yin, Nourish Kidneys, clears heat. Low-grade afternoon fever, Heat in the Five Centers, flushed face, red cheeks, uneasiness, night-sweating, nocturnal emission (with dream), chronic throat pain, frequent urination in small amounts of dark urine, hot flashes associated with menopause. Take 8 pills (1280 mg) 3 times a day with warm water.